Mendoza, a provincial capital of approximately one million people, is a location that provides students the opportunity to fully immerse themselves in Argentine life. Long renowned for its world-class wines, Mendoza has become the center of Argentina’s wine industry, and because of its proximity to the mountains, a center for adventure tourism. A bustling city with a pleasant, dry desert climate and broad sycamore-lined streets, much of Mendocino life is lived outdoors in plazas, parks and sidewalk cafés, where students have many opportunities for meeting and getting to know Argentines. In addition, Mendoza provides easy access to interesting outlying villages, mountains and rural recreational areas and is just a one hour flight from Santiago, Chile. The Mendoza program is offered in partnership with CELE (Centro de Español como Lengua Extranjera), an institute dedicated to teaching Spanish as a foreign language. CELE is located within the Universidad Nacional de Cuyo, Mendoza’s large regional university, and HWS students have complete access to University life, including a wide range of student organizations and activities. 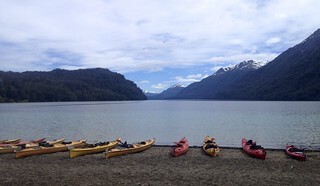 CELE arranges courses and a variety of excursions for our program, through which students will enhance their Spanish language proficiency and explore issues of development and the historical, political, and socioeconomic realities of Argentina and neighboring countries in the Southern Cone. All students will take three courses offered through CELE and UN Cuyo. This includes a Spanish language course (according to their level of proficiency) and two classes taught in English: History and Culture of Argentina and Argentina and its Neighbors. In addition, students will take one course offered by the HWS faculty director. This course is taught in English and will provide an overview of Argentine history and culture through units focused on themes such as music, economics, politics, literature and film. In addition to the readings and presentations by a variety of guest speakers, the course will include a number of excursions to relevant local sites (museums, vineyards, and local businesses) as well as longer program excursions that may include Patagonia, Córdoba, and Salta. This course will focus on current events and politics in the Southern Cone of South America. Students will compare and contrast institutions and policies in Argentina, Brazil, Chile, Paraguay and Uruguay and examine key issues and relations among these countries. This course will examine the rise, fall, and aftermath of military dictatorships in the Southern Cone, focusing primarily on Argentina (1976-83) and Chile (1973-90). Specifically, we will look at how authoritarian regimes came to power, how they applied “state terrorism” (surveillance, torture, and assassination) to impose social control, and how the use of terrorism against internal targets fostered the growth of an international human rights regime aimed at establishing truth and implementing justice in these two countries. The cases of Argentina and Chile function as a microcosm for Cold War politics in the Western Hemisphere, and as such force us to reflect on the role of the United States’ collaboration with terror regimes, but also in untangling their legacies. This course will serve as a 200-level History course, but will be cross-listed with International Relations and Latin American studies. Optional Activity—Community Service. For students who are interested, community service opportunities can be arranged by CELE and the resident director. The Argentina program is especially appropriate for students in History, International Relations, Spanish and Hispanic Studies and Latin American Studies. This program is open to sophomores, juniors and seniors in good academic and social standing with a minimum GPA of 2.5. Due to the challenging nature of study abroad, student academic and disciplinary records will be carefully screened. Each student will live with an Argentine host family—the best way to ensure a comprehensive language and cultural immersion experience. Homestays are coordinated by the staff of CELE, which has nearly twenty years’ experience matching host families and students. Breakfast and dinner are provided by the host families. The language and culture courses taught by CELE include a number of local excursions in Mendoza (including museums, wineries, and parks) along with visits to an Argentina indigenous community and a local mountain village. In addition, longer excursions to Patagonia, Córdoba, and Santiago, Chile are tentatively planned. Students will be charged standard HWS tuition and room fees, 2/3 board, and a $600 administrative fee. This will cover credit for a four-course semester, health insurance, housing and partial board, and all course-related excursions. Note that students should bring the remaining board (approximately $950) to cover meals not included. Additional expenses not covered include airfare, visa, books and other course related materials, and personal expenses (entertainment, some local ground transportation and independent travel). We estimate airfare for this program at $1400 from the East Coast, and books and course-related materials at $250. It is difficult to give an accurate estimate of personal expenses because student spending habits differ considerably. We would suggest a minimum of $1250 above and beyond meal expenses. However, students on a tight budget should be able to manage with less. If you are concerned about finances, we strongly encourage you to talk to the CGE staff who can offer information and advice based on your specific situation. This program is offered in the Fall semester of even years.